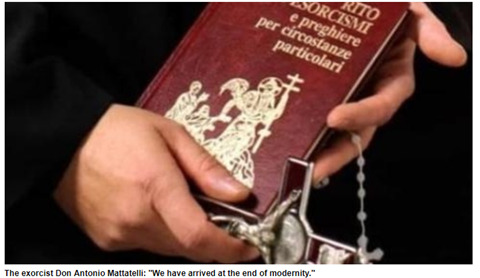 Exorcist: "The world is coming to an end"
(Rome) An exorcist says: "The world is coming to an end, hurricanes and earthquakes are the proof", but not because of too much CO2 emissions, but because of sin. "The natural catastrophes are the proof: the end of the world approaches" when people do not repent. Don Antonio Mattatelli is one of the most famous exorcists in Italy. In the month, he asked questions from radio cusano campus moderators and spoke dramatic warnings in an undramatic tone. Because of the references to natural catastrophes, they recalled at first glance the panic-making of Klimagurus. Also, Pope Francis spoke on the same day on the return flight from Colombia in apocalyptic tones . The content of the papal utterances and that of Don Mattatelli are nevertheless fundamentally different. The difference lies in the spiritual dimension. Natural catastrophes - Who is to blame: CO2 emissions or sin? While Pope Franziskus quoted the bad news of an unspecified "university", according to which mankind has only "three years" to "turn around" in climate protection, "the consequences will be terrible," exorcist Mattatelli says of "conversion "And establishes a connection with sin. "It will not be generally the end of the world, but this world already. So sudden and powerful natural catastrophes prove it. There is mistrust of the future. We are at the terminus of modernity. " "Behind Kim Jong-un is certainly Satan, because in North Korea all religions are forbidden. Only the person's leadership of the Fiihrer is permitted, who wants to replace God. " Asked if an exorcism could be carried through Kim Jong-un, Don Mattatelli united. A real exorcism is not possible, because it requires spatial proximity. "But at least one could be prayed, at least, as prayer. Pius XII. has exorcised the exorcism over Hitler, of course from the Vatican. That would be possible. It would not be a real erxorcism, because the person must be present. But the words could be said, it would always be a prayer. Don Antonio Mattatelli is a disciple of the exorcist Father Cipriano De Meo OFM Cap, who also knew Father Gabriele Amorth SPP, the most recent exorcist, who died last year. Pater Amorth was the 24-year head of the Romans. "Amorth would never have approved the publication of exorcism film clips"
Mattatelli also took a position on William Friedkin's recent documentary " The Devil and Father Amorth " at the film festivals in Venice . It shows the recordings of an exorcism which Amorth had carried out shortly before his death, according to Friedkin in April 2016. While Friedkin stated at a press conference that Amorth had allowed him to record the film with a video camera, Don Mattatelli cannot imagine the late exorcist having agreed to the publication of the material. "I've known him. He would never have permitted the publication of the footage. This is a violation of the private and even the intimate sphere of those who were referred to as exorcism. I have so far only allowed sound recordings, if the persons concerned wanted this expressly. Any spectacle of exorcisms must be avoided. These are often long and delicate processes, which can also take years. " Don Antonio Mattatelli, until recently the youngest exorcist of Italy, was ordained priest in 1997 and is pastor of Montemurro in the diocese of Tricarico (Basilicata). From 2000-2005, he also taught the doctrine of the Trinity at the Theological Institute of the Interdiocesan Priestly Seminar of the Basilicata. Since 1999, he has also been the Director of the Tricarico Diocesan and the Spiritual Assistant of the Charismatic Renewal and the Cursillo Movement of the Diocese. Among his books on demons and exorcism, the biography "A saint against the devil" (Un Santo contro il demonio) about the Capuchin and exorcist Father Matteo d'Agnone (1536-1616) stands out. Don Mattiatelli compares the servant of God with the holy Father Pio of Pietrelcina and calls him a "giant of the Church".Motu proprio Summorum Pontificum in both forms of the Roman Rite.